This is a popular Youtube topic and I can understand why. MAC is a very accessible line that is a bit of a “gateway” makeup brand for many people, myself included. MAC offers high quality cosmetics in a wide variety of colours and finishes, at a reasonable price point (compared to department store or Sephora brands). My makeup collection began with essentials from MAC, including lots of their eye shadows. I now own 89 MAC eye shadow shades, which is roughly 15% of my total eye shadow collection. These are my top 10 MAC eye shadows – unfortunately I can’t guarantee that all of these are in the permanent collection (in fact, one shade was in their permanent collection but now discontinued!) 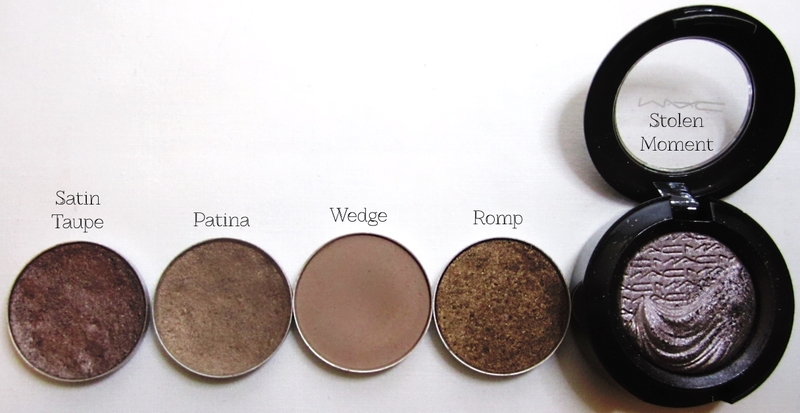 Note that these are only MAC’s powder eye shadows, I will do a separate post on Paints / Paint Pots and Pigments. They’re roughly in the order of my preference and usage – the ones with the asterisk mean I own a back-up of them. I purchase most of my MAC eye shadows in the refill pans – the ones in the individual packaging are usually from limited edition collections (I debate back and forth whether I should depot them or not). 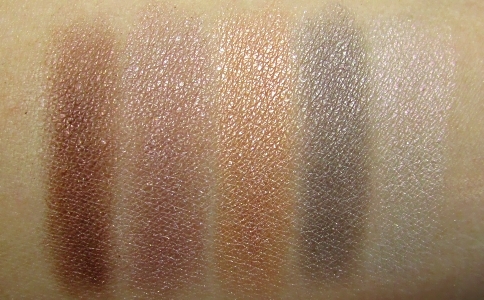 Below are swatches of each and more detailed descriptions. This makes creating definition on my eyes a breeze, with just this one single shade. Satin Taupe is the taupe that I gauge all other taupes against. 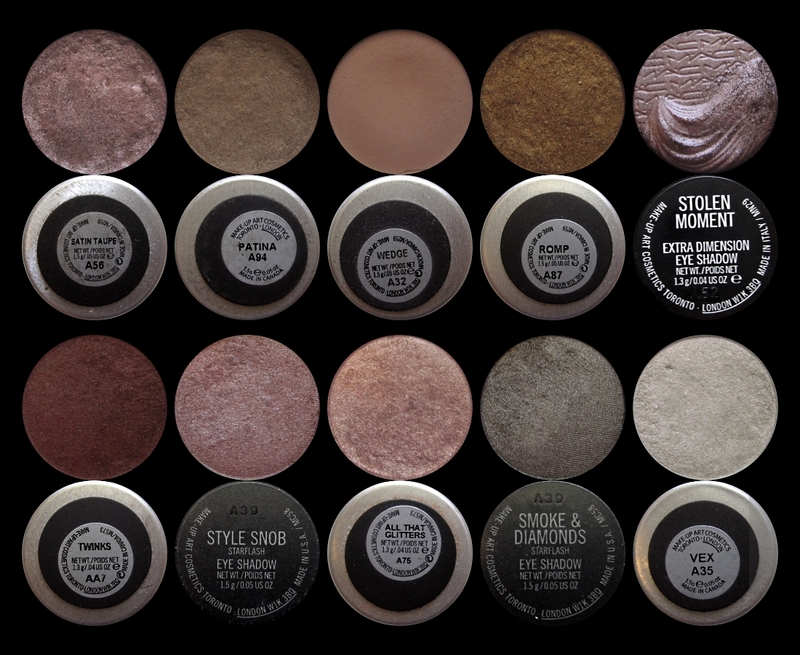 It tops not only my MAC eye shadow list, but my favourite shade of all of my eye shadows. That’s a bold statement when one owns more than 600 eye shadow shades! It’s a sandy brown with a touch of tarnished sheen – looks odd in the pan but it adds depth to an otherwise simple eye look. I enjoy wearing this on casual days or if I’m doing stronger lips or cheeks. This was one of the first MAC eye shadows I ever bought (along with Jest and Vex) so it has a special place in my heart. Out of all of the shades listed here, this is the one I use most frequently, as it is a good basic transition colour for just about any eye look. It’s not terribly unique but it’s highly blendable and the colour is neither too warm or too cool. This was recommended on Makeupalley as a good bronze shade without an orange undertone, and that’s exactly why I like this shade so much. I know Woodwinked is on a lot of favourites lists but it’s too warm on me. When I learned that MAC had discontinued Romp, I was quite distraught and tried to find dupes, but to no avail (it is NOT the same as MAC Tempting or Bronze!) In the end, I was able to find a reputable seller on ebay and acquired a back-up that way. The Extra Dimension finish is a limited edition-only finish; MAC describes the formula as a “liquid-powder hybrid, delivering high-resolution colour and prismatic reflections.” It’s a buttery formula that lasts very well through the day. This shade is a variation on Satin Taupe – it’s a bit deeper and cooler and has a little more reflective particles. Veluxe Pearl is my absolute favourite finish from MAC – all the shadows in this formula are buttery, pigmented, and blendable. I wish MAC would expand their Veluxe Pearl range. Twinks is a rich chocolaty plum that pairs well with just about any light shade. This was from the “Love That Look” collection in 2009, and it is essentially a lighter version of Satin Taupe in a smooth and high shimmer limited edition formula called Starflash. MAC only ever released the Starflash finish once even though it’s a fantastic formula – I only own 2 Starflash eye shadows and they are both on this list. I do kick myself for not having bought more shades – if MAC ever decides to re-release this formula, you can be sure that I’ll be grabbing more! I would say the most similar formula to Starflash from MAC’s permanent collection is Veluxe Pearl. This has a peachy beige undertone that makes it more wearable for me than Jest, which was too white and frosty. 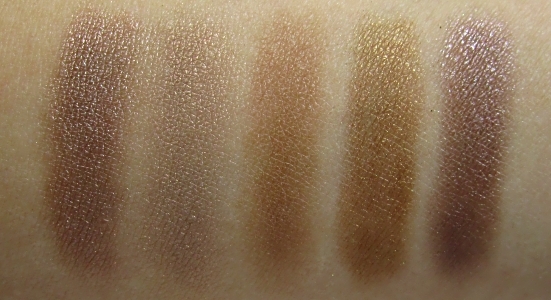 This pairs well with browns and bronzey shades – from my top 10 list, this goes amazingly with Twinks or Romp. In typical Veluxe Pearl quality, this is smooth, pigmented and blends easily. This is a highly sought after shade by those who missed out when it was released – there are lots of posts looking for possible dupes (people claim Stila’s Diamond Lil is a dupe but I disagree, I own that too and while it’s close, it’s deeper and more green compared to this). Smoke & Diamonds is a gunmetal shade with a hint of warmth thrown in – it makes a fantastic single colour eye shadow look with a shimmery flash. This is one of those colours that look boring and somewhat ugly in the pan but it’s a neat shade that can transform other colours it’s paired with. It has a duochrome finish, flashing light pink or green sheen depending on the angle. It looks stunning on top of dark bases. Yup, all neutrals. Out of this list, I own: All That Glitters, Satin Taupe, Woodwinked, and Ricepaper. I bought these directly from MAC stores, over many years – the oldest ones here are Vex and Patina – you can see the labels on those are a bit different than the rest. What are your top MAC eye shadows? Great post I’m still trying to fill my palette and I think I need to add Satin Taupe. Soft Brown & Woodwinked are my faves of what I have. Oh yes, Satin Taupe is a must! I haven’t tried Soft Brown yet but I’ve heard good things. Lovely shades! Your collection so puts my zero mac eyeshadows to shame haha! Hahaha I can imagine thats what will happen to me when I get started! When you start you just can’t stop haha! Ohhhhhh! Good picks!!!! They are all so pretty and versatile! I love that you mentioned Woodwinked – it’s one of my faves!!! Ugh, too bad about Romp – HATE when MAC discontinues the good ones. Also, I NEED Vex!!! Thanks! They’re great shades that would be universally flattering! Has Twinks been discontinued? If so, can you recommend a similar colour? 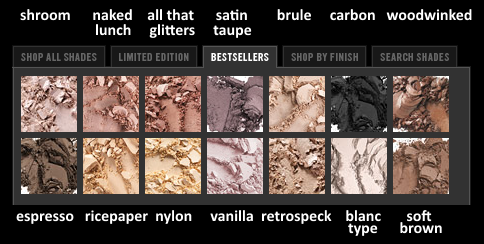 If you’re looking for a dupe, check out Temptalia’s dupe page, it’s super handy!